Is the BRI too big to fail in re-creating a “new” tributary system of China? President Xi Jinping’s ‘Thought on Socialism with Chinese Characteristics for a New Era’ is now firmly enshrined as the North Star for Government action as the 19th Communist Party Congress concluded late last year. His thought incorporated into the Constitution is the continued development of the Belt and Road Initiative (BRI) as part of the China Dream. The BRI was first introduced by Xi back in September 2013 as a ‘One Belt and One Road (OBOR) strategy’ during his visit to Kazakhstan. If implemented as planned, it is expected to relieve China of the “Malacca dilemma”. It is a phrase coined in 2003 by then President Hu Jintao on China’s over-reliance through the Malacca Straits between Indonesia and Malaysia. The enormity of such an undertaking, of course, raises far more questions. Indeed, there are many reasons for BRI, and while it is true that many countries along the Belt and Road are in desperate need of large-scale infrastructure investment, it is also true that there are myriad other reasons why China would find these investments worth the attendant risks. One reason is to diversify and achieve better returns in China’s foreign exchange reserves. Currently, China sits on somewhere around three trillion dollars. When the OBOR was first introduced in 2013, the returns were earning less than one-percent a year. The hope is that the infrastructure investments will generate a higher profit. Another reason is to provide relief for domestic overcapacity and the myriad zombie State-Owned Enterprises (SOEs), particularly “within the metals and construction and materials sectors.” Beijing has tried to decrease the high levels of inequality between the wealthier coastal cities of the east and the poorer interior western regions through state-directed investments. Not surprisingly, it is in these western regions such as Gansu, Ningxia, Qinghai, Tibet, and Xinjiang, where there is a high-concentration of SOEs and a low-penetration of private initiatives. Among many other reasons, it is as much, if not more, a matter of self-interest; part of its overall strategy of peripheral diplomacy, as it is about regional stability and development. As such, some are arguing that since these infrastructure projects are motivated more by political factors than real economic rationale, there is significant risk that these projects will fail to deliver the returns expected. These concerns are not without merit. The ratings agency Fitch, for one, is sceptical that “China’s banks can identify profitable projects and manage risks better than international commercial banks and multilateral lenders” with decades of experience in financing emerging-market infrastructure. “After all, Chinese banks do not have a track record of allocating resources efficiently at home, especially in relation to infrastructure projects.” As such, they are unlikely to have more success overseas. Meanwhile, local politicians are incentivized by hanging onto the coattails of these white elephant projects, subordinating business logic to political agendas, and increasing the risks of unprofitable projects. In the aftermath of the Sri Lanka’s Eelam War that ended in 2009, Western nations began distancing themselves from the Rajapaksa regime over concerns of war crimes and corruption allegations. When President Maithripala Sirisena unexpectedly defeated Rajapaksa in the 2015 election, he had campaigned on the promise to extricate Sri Lanka from China’s onerous debt terms. But by then, the die had already been cast. Exacerbating the issue was that, having risen to a middle-income country, it no longer qualified for concessionary loans and has had to obtain commercial credit where terms are guided by the markets. Unable to pay its mounting debts (more than 95% of Government revenue goes toward servicing debt), and already near default, the Colombo Government was forced to do an about-face and enter into a debt-equity swap in which China would pay $1.12 billion for a 99-year lease agreement in which China would have a 70% stake in the Hambantota Port and the control of a strategic land parcel in the Colombo Port City. The far-reaching strategic implications are now clearand certainly have not been lost on protesters and critics who claim that the island’s sovereignty has essentially been handed over to China as if it were Hong Kong to the British Empire.It’s no surprise that some observers call it “One Road, One Trap” to revive President Xi’s “China Dream” into a Middle Kingdom’s tributary system in other means. 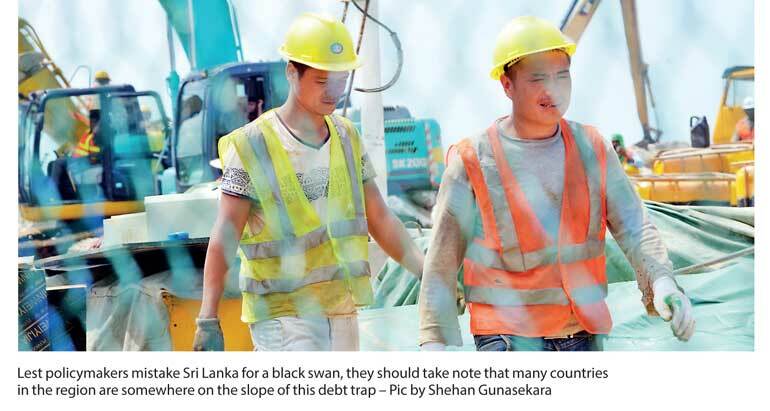 Lest policymakers mistake Sri Lanka for a black swan, they should take note that many countries in the region are somewhere on the slope of this debt trap.The China-Pakistan Economic Corridor (C-PEC), Malaysia’s Forest City, Cambodia’s Sambor Dam and other infrastructure projects, as well as Bangladesh, Nepal, Indonesia, Maldives and other countries such as Ethiopia, Kenya, and Venezuela, are all vulnerable to significant economic, political, and environmental risks when they too readily accept Chinese money tossed in their direction. In a similar blow to OBOR, Nepal recently “scrapped” its $2.5 billion, 1200 MW Budhi Gandaki hydropower plant with the China Gezhouba Group Corps (CGGC), citing “irregularities” because CGGC had been “selected without initiating a competitive bidding process.”; a breach of Nepal’s Public Procurement Act. Budhi Gandaki had also been identified by China as a component of OBOR. This clearly reveals the working of invisible hands by a very visible statecraft with a mission to create a “pacific” New World Order mirroring the old tributary system as the Chinese Flag has now just risen in Hambantota and Colombo.